In 1979, German manufacturer BMW introduced the Procar Championship. The series featured the company’s M1 supercar, and was contested as a support series to the European rounds of the Formula One World Championship. The venture proved to be a very lucrative source of publicity for the Bavarian brand, as the Procar races were generally some of the most competitive and exiting events of the weekend. With current Formula One aces like Niki Lauda and Nelson Piquet squaring off against lesser known GT-drivers, the crowd was always at the edge of its seat. Although the Procar Championship quickly became a fan favorite, it only lasted for two short seasons. BMW had decided to enter Formula One in earnest, which made the M1’s obsolete. The BMW M1 Procar series was tremendously exciting to watch. Eight years later, the flamboyant Italians at Alfa Romeo were hoping to recapture the magic of the Procar Championship. Interestingly, they were looking to make the opposite switch to BMW. Whereas the Germans had used the Procar as a means to get into F1, the Italians desperately wanted out. Alfa Romeo had returned to the sport after a a 28-year absence in 1979, and found itself constantly lagging. Initially their 177 was powered by a flat-12, but the advent of ground effect aerodynamics made this low and wide layout impractical, since it blocked the path of the venturi tunnels needed to generate the mysterious new force. In response to this, a V12 was constructed for its successor. Unfortunately it once again came too little too late, as by then naturally aspirated engines were being overtaken by turbocharged weaponry introduced by Renault in 1977. The plagued team finally turned turbo in 1983, but their unusual 1.5L 890T V8 was hopelessly unreliable, thirsty and way too slow. The turbo era was not very kind to Alfa Romeo. After treading water for three more seasons, the illustrious Formula One team went under for the final time. Alfa Romeo pulled out of the championship as a manufacturer in 1985, but remained as an engine supplier to the tiny amateur Osella outfit until 1987. During the horrors of 1983 with the appalling 890T engine, Alfa Romeo moved to construct a replacement in the form of the innovative twin turbo 415/85T four cylinder engine. Following the successes of Brabham and their impossibly powerful BMW M12/13 four-banger, and a proposed reduction in maximum displacement to 1.2L, this seemed to be the best option at the time. The success of Brabham's BMW-powered BT52 motivated Alfa Romeo to take a different approach. The new engine was ready by the end of 1985, but by then the factory team had already dissolved. Not wanting to waste their investment, Alfa Romeo turned to French team Ligier, which was about to lose its engine deal with Renault. An agreement was signed for the 1986 season, but the Alfa-engined Ligier was never raced. The tragic death of Elio de Angelis in a testing accident and spiraling costs prompted the FIA to not only abandon the plans to decrease displacement, but to slowly phase out the turbo engines over a two year period. Chief engineer Gianni Tonti testing the V1035 engine. This disastrous development made Alfa Romeo miss its mark once again. The engine deal was finally broken off after Alfa Romeo experienced a shaky period after being taken over by Fiat, and Ligier driver René Arnoux made some very damning statements in the press. The dramatic break with Ligier was exacerbated by fact that Alfa Romeo had already designed and built an engine to conform to the new 3.5L naturally aspirated engine formula which would take over completely in 1989. During the early design stage, engineer Pino d’Agostino made one of the boldest and most important decisions in recent times. Traditionally, large racing engines were made in either a V8 or a V12 format. A V8 engine would normally be smaller, lighter and easier on fuel than the V12, but would lack the power, torque and suppleness of the bigger engine. Unsatisfied with having to choose between the two, d’Agostino proposed a compromise in the form of the radically different V10-layout. The V10 was more compact, lighter and more fuel efficient than a V12, but produced nearly the same power. With this invention, Pino d’Agostino had unknowingly shaped the future of Formula One. Sadly, the botched marriage with Ligier caused the V1035 to become orphaned. With no F1-team to lend it too, Alfa Romeo was forced to come up with another use for their multi-million lire investment. The FIA had already killed the vastly expensive turbo program, so the company really needed to find a way to recoup its losses. Luckily, that same FIA presented a way out in 1987. The ProCar was essentially an F1-car with door handles. In an effort to relive the days of the BMW M1 Procar Championship, the governing body wanted to form a second support class to the pinnacle of motorsport, the humorously named Production Car Championship. This time however, the series would not be exclusive to just one manufacturer. Instead, a new formula was introduced which consisted of silhouette racers clad in bodywork resembling ordinary road cars, reminiscent of the Group 5 monsters used in the late 1970’s. The cars would incorporate a host of Formula One technologies, including the engines. Especially from the rear the ProCar appears as an exotic cross between an F1 car and a Group C prototype. To Alfa Romeo this was the perfect opportunity to transform the failed engine program into a fire-breathing PR-machine. To help with the development of the car, the Italians acquired a controlling interest in Motor Racing Developments, the company behind the Brabham Formula One team. Together they developed a carbon fiber monocoque chassis, and placed the 3.5L V10-engine smack dab in the middle. Suspension wise the car borrowed a great deal from the wildly popular Group C prototypes of the time. For this reason the driver sat on the right side, a trait taken from the Le Mans prototypes to improve weight distribution on the mostly right-turning Circuit de La Sarthe. The unit had been slightly detuned from its original 630 horsepower to 605 to increase reliability. Even so, the engine reached a dizzying 12,100 rpm to produce its max power, with its 373 nm (275 ft lbs) of torque coming in at 8300 rpm. This mechanical savagery was then mated to a Hewland six-speed manual transmission, which fed the rear wheels. For marketing purposes the chassis was clad in a fiberglass representation of Alfa’s new flagship model, the elegant 164. In all the brutal racer weighed just 750 kg (1,654 lbs). The 164 ProCar revealed little about its feral nature from the outside. To the outside observer the 164 ProCar appeared reasonably pedestrian. Apart from the sizable rear wing, the car revealed very little about the volcano located between the rear doors. There were no wide wheel arches, massive splitters, giant intakes, or stupidly large wheels to be found. Even after getting in through the mundane and very conventional doors, the average consumer would be hard pressed to spot any sign of the ProCar’s heinous purpose. Alfa Romeo had even taken the trouble to mount part of a back seat complete with headrests above the screaming V10. But as soon as the angry engine started up, all hell would break loose. Even the car's interior looked relatively inconspicuous. Due to its light weight and ferocious power, the scarlet rocket was actually faster than a Formula One car in a straight line. Aided by its aerodynamic bodyshell, the car could reach speeds of over 340 kph (211 mph). The standard sprint from 0-100 kph (0-96) took just two seconds and the quarter mile was over in 9.7. All systems were go on the ProCar championship, leading to Alfar Romeo bringing one of the two test cars to the 1988 Italian Grand Prix at Monza. Behind the wheel was Italian F1-veteran Ricardo Patrese, who had driven for Alfa Corse during the painful turbo years. Even though Patrese was now at Williams, he agreed to do a short demonstration run in the lead up to the Grand Prix. All eyes were on the 164 as it turned on to the track, and the mighty howl of the V10 made it an instant hit with the tifosi. The car looked great, sounded biblical and above all, it was a true Alfa. Patrese gave his all during those few short laps, leading to a recorded top speed of 350 kph (217 mph) down Monza’s endless pit straight. By comparison, Ayrton Senna’s all-conquering McLaren MP4/4 could only manage 309 kph (192 mph). The car’s immense performance was a bit of a shock to the paddock, and the Alfa reached headlines everywhere. For the first time since 1951, one of the company’s F1-related projects found itself in a positive light. However, Alfa Romeo’s happiness over the car’s successful debut swiftly evaporated when the FIA’s plans turned out to be an empty shell. Apart from Alfa Romeo, no other manufacturer had entered the FIA’s supposed multi-brand championship. The Italians were the only ones who had taken the time, effort and funds to make a vehicle suited to a class which never actually existed. For the third time in a row, the company had built something with nowhere to race it. Left with no other option, the ProCar program was quietly cancelled. 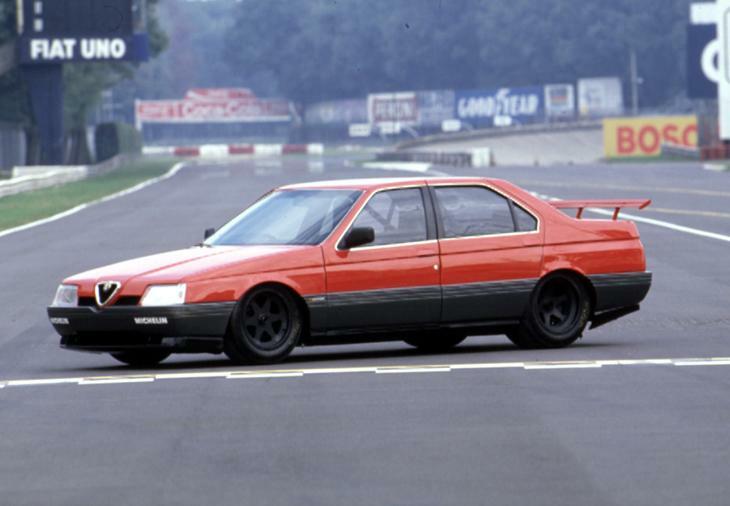 The Alfa Romeo 164 ProCar was the excellent result of the desperation of a legendary manufacturer. Struggling to find a return to form in F1 and suffering from bad business deals and a change of management, Alfa Romeo turned to the promising Production Car Championship to avoid losing yet another investment. In the end their efforts were largely counter-productive. Despite a successful showing from their spectacular car, the program was cancelled after the FIA-plans turned out to be a sham. Because no other manufacturer had taken the bait, the Production Car Championship never got further than just a concept. For the third time in a row the Italians had lost a ton of time, manpower and money to a pipe dream. But, passionate and tenacious as they were, they refused to give up just yet. The V1035 engine was dusted off for one last try, which resulted in the also still-born SE048 SP Group C Prototype.